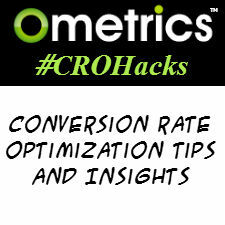 If you have a conversion hack add it to the comments below or send it to me with your name and twitter handle for credit to greg@ometrics.com. CROHack 41 – We don’t see things as they are, we see them as we are. So be careful not to disturb your test with your own perspective. CROHack 43 – A/B testing: Finding a loss is a win, because you avoided pushing live ‘non-improvement’. It is just as important to know what does not work. CROHack 44 – Optimize conversions by device. Start with removing images on the smaller devices such as cell phones. CROHack 45 – A test showed more clarity with customer surveys by removing predefined answers and analyze the text response only. – It is better to get a lot of answers and take the time to bucket them than to bucket what you think are the answer and force them onto your users. Often I will do a broad text answer survey then once I have the buckets of answers do another survey with a radio button for each bucket. CROHack 46 – Small changes often make a big lift. Never overlook a small change like one word or removing one element. And just because they are small does not mean you should test them all at once. CROHack 47 – Listening to your customer – To many companies get ideas internally which means they are all really coming from the same source. Myself and other consultants will happily give you a list of ideas to test for a surprisingly low cost one time or monthly. CROHack 48 – What has worked in the past does not necessarily work in the future.